CanadaMortgageNews.ca – Page 85 – News, Views and Trends! Fixed Rates increase for the second time in 2 weeks..
Royal Bank increased their fixed mortgage rates again by 0.25%….that’s an 0.85% increase in 2 weeks… Scotiabank increased their rates shortly afterwards. We can expect the other Major Banks to follow this latest increase. What’s interesting about this move is that the bond market has not increased by the same amount…. On February 15th 2010, the 5 year Bond yield was 2.53%…today, it’s 3.08%….Mortgage Lenders and Banks want to earn a 1.20% to 1.30% spread in the wholesale mortgage market… Today’s best 5 year fixed rate mortgage is 4.39% but will increase to around 4.64%…. That puts the spread all the way up to a whopping 1.56%. CIBC’s Avery Shenfeld was quoted as saying interest rates would remain low through 2011… hey, that’s a different message from what we’ve been hearing lately… complete article here..
Lower rates for longer period of time? Hmmmm…wonder how the media can turn that into a negative story…. (sorry, couldn’t resist the sarcasm). Yes, it’s GOOD time to borrow money.. don’t let anyone tell you otherwise… these are historical lows….Enjoy! 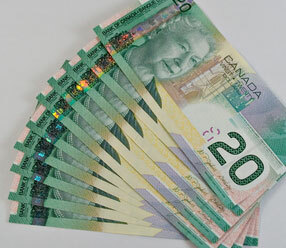 Today, the Canadian $ hit 100.12 cents briefly this morning…. A clear signal that the rest of the world is viewing Canada as having a very stable and solid economy…. Here’s an article with forecasts of the dollar remaining at these levels into next year…. The 5 year Canadian Bond yields jumped to over 3.00% for the first time since October 2008… That’s the same time the U.S. Sub-Prime mortgage crisis hit and the world fell into a recession. Bond yields affect fixed rates…..current 5 year fixed rates are hovering between 4.19% and 4.39%… today’s Banks and Mortgage Lenders are looking for a 1.20% to 1.30% spread and we are that level… Further increases in the Bond yield will cause fixed rates to go up….